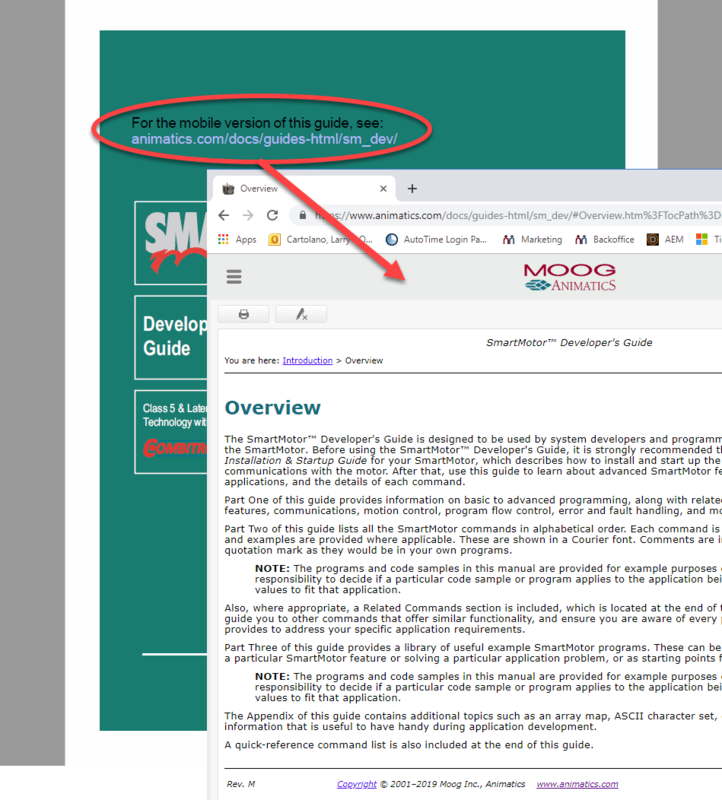 Moog Animatics is pleased to introduce its SmartMotor™ Guides in Mobile-Compatible HTML5 Format, in addition to the existing PDF guides. Moog Animatics is pleased to announce the release of its SmartMotor™ guides in mobile-compatible HTML5 format. In addition to the existing PDF (Portable Document Format) guides, corresponding mobile-format guides are now available. While PDF does work across all devices, some users prefer navigating in an HTML-based document. So, we’ve been working hard behind the scenes to bring our mobile-format guides online. No matter what your preference, PDF or HTML5, you can freely access each format using links provided in each document. To access the mobile version of a guide, simply click the “For the mobile version of this guide…” link on the cover of the PDF file or use the Mobile Version bookmark. Corresponding links in the HTML5 document will return you to the PDF version. This valuable, free resource is available now from the Moog Animatics website. Contact Moog Animatics today for more details on this new document format and our complete library of website resources, which are designed to help you quickly get up to speed, understand the full feature set, and maximize the performance and benefits from your SmartMotor fully integrated servos!